The New Zealand Mint is one of the world’s most highly regarded facilities, often producing one-of-a-kind collectible coins you won’t find anywhere else. One of its newest releases is the Star Wars Force Awakens Series, featuring three releases to date that feature characters from the first release of the sequel trilogy. 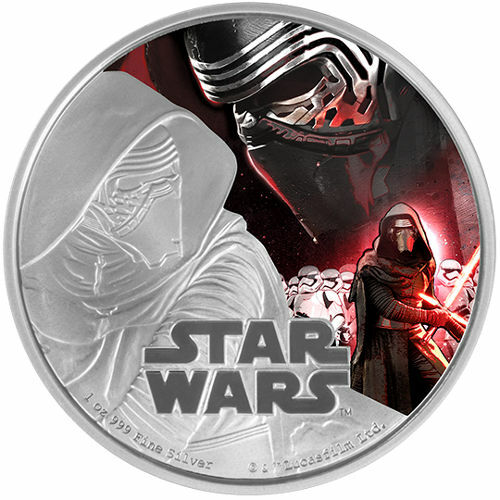 The 2016 1 oz Silver Niue Star Wars Kylo Ren Coin is available for purchase now on Silver.com. Limited total mintage of just 10,000 coins! 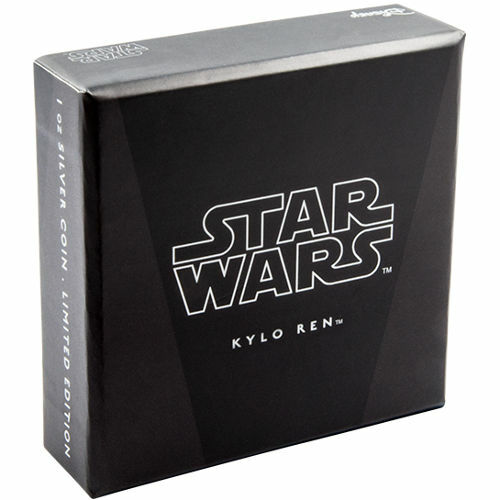 First release in the Star Wars Force Awakens Series! Ships to you encapsulated in plastic and contained within a themed shipper. Issued a face value of Two Dollars backed by the government of Niue. Reverse features colorized images of Kylo Ren from the feature film. With the release of Star Wars: The Force Awakens in December 2015, a whole new generation of Star Wars fans was born. Old and young alike packed movie theaters around the world to see what was to come in an era after the Empire had been defeated. Emerging from the ashes of the Empire’s evil was a dark warrior named Kylo Ren. The leader of First Order missions, his fiery temper often led him astray and his own suspicion of the limits of his power made him an engaging character in the first of the three new films slated for release. 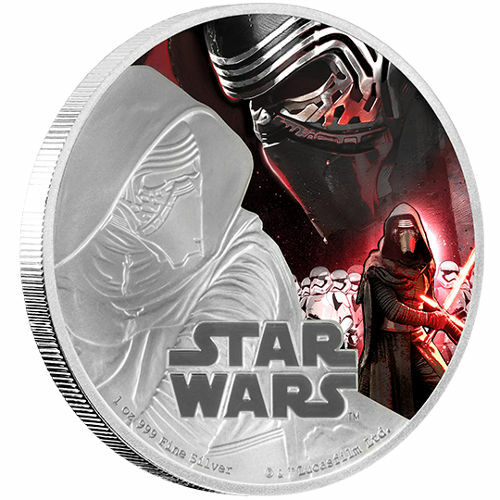 On the reverse of the 2016 1 oz Silver Niue Star Wars Kylo Ren coin is the colorized image of Kylo Ren. In fact, you’ll find three different images on this one side. Along the top, a colorized image shows a closeup of Ren’s masked face, while just below it you can see a feature-film inspired shot of him leading storm troopers on a mission. A third image remains in silver. 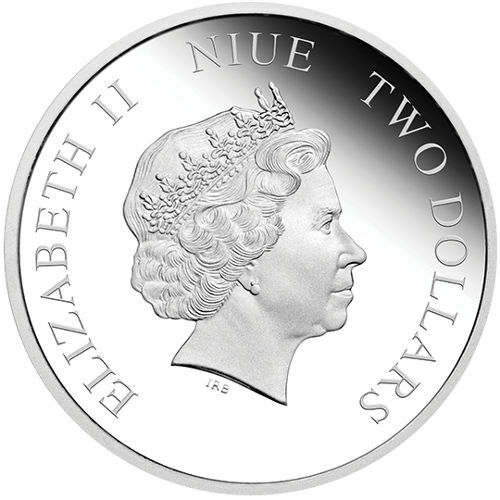 The obverse of each coin depicts Queen Elizabeth II in right-profile relief. This image is standard on all New Zealand Mint coins, and was created in 1998 by Ian Rank-Broadley. These 2016 1 oz. 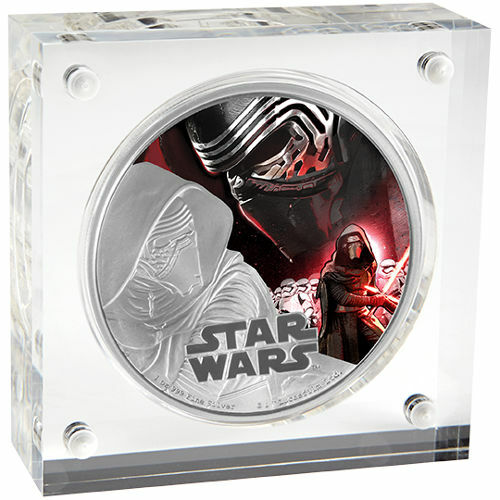 Silver Niue Star Wars Kylo Ren coins are the first release in the Star Wars Force Awakens Series from the New Zealand Mint. Located in Auckland, New Zealand Mint is a private facility and the only one of its kind in the country. However, it is not the sovereign mint of the nation. The Star Wars Force Awakens is one of two Star Wars-themed series in production at the mint. Please feel free to contact Silver.com at 888-989-7223, reach out to us online using our live chat, or email us directly. To see similar products, visit our New Zealand Silver Coins page.